As usual, I plan the events I would like to run about a year in advance. This helps in scheduling since so many events are getting hard to get in to and also aids in preparing to achieve the goals I set for myself. So about a year ago while looking at my list of want to do's, I decided I need to get another Boston Qualifier. I had originally planned to only run Boston one time but since Karla had cancer last time and we had to run slowly just to finish, we have decided we must go back and race it now that she is cancer-free. So I decided with my full ultra schedule planned for 2008 that I should go ahead and try to get a qualifier this Fall so I could concentrate on ultra training. I have run in Richmond 3 times before and it is a fairly fast course and comes at a good time of year for weather and my training so I chose it. Two years ago, the usual suspects Karla, Jerry and Margo made the trip with me as I tried to qualify. I was not quite ready, but despite cramping up in the last 4 miles, I set a PR and we all had a great weekend. 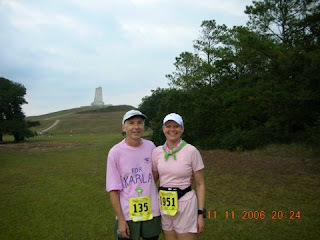 I was hoping to have the whole group run return with me, but Margo was running in Raleigh and Karla and Jerry wanted to return to OBX . I could have tried for my qualifier there but being a runner of little brain, Ultraman decided it was a good idea to do both! So this Saturday I will be running fast at Richmond ( I hope! ) and then run with the Marathon Princess like last year at OBX. Jerry may try running with us this time. My training has been going pretty well despite having plantar fasciitis since August. I have been treating it aggressively since I figured out what it was and it is improving greatly even while maintaining my mileage and adding speedwork back into my routine. My biggest concern was whether I would have enough recovery time after running at Hinson Lake 6 weeks ago. I had been a bit sluggish and had a sub-par run at the ATT 10 miler but in the past 10-12 days the life has returned to my legs and I'm feeling confident of a good run. Anyone who wishes can track my progress in Richmond Saturday morning. The race is having live updates at the half marathon and 20 mile marks . 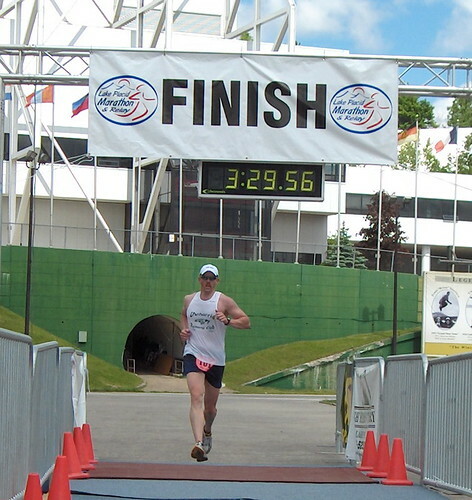 I hope to hit the half in about 1:47 and 20 in about 2:43 .